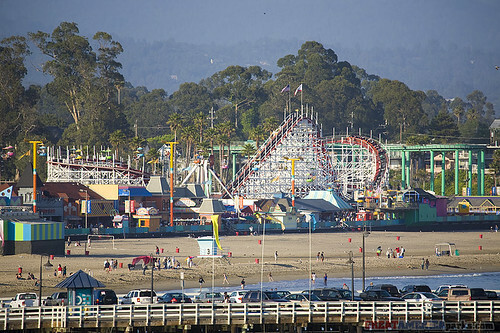 For our February 2009 update on the Santa Cruz Beach Boardwalk, click “Read More…” below. The biggest news from the Santa Cruz Beach Boardwalk this month is our upcoming event, the SCBB Behind-the-Scenes Tour II. Look at the picture below, don’t you just want to go? I thought so. We look forward to seeing you there. The Santa Cruz Beach Boardwalk invites all 2009 Season Pass Holders to bring a friend for FREE on Saturday and Sunday February 7 & 8, 2009! Just come to the Guest Services window (Near Neptune’s Kingdom) on Saturday February 7 and/or Sunday February 8 with your Season Pass and your friend. When you pick up your Season Pass wristband for the day, your friend receives ONE All-Day Unlimited Rides Wristband FREE! * If you have questions about this offer please email guest.services@scseaside.com or call (831) 423-5590. In February, the park is open on weekends only & President’s Day, Monday, February 16th (and aren’t we lucky they are, makes we want to call my friends in Boston to see what parks they are visiting this time of year). Neptune’s Kingdom, Casino Arcade and Boardwalk Bowl are open every day in February. EVENT: Saturday, February 21, 2009, join the fun and excitement of the 28th Annual Clam Chowder Cook Off! Talented chefs from throughout the West Coast compete for the glory of the BEST CLAM CHOWDER! Best of all, the SCBB have created a new YouTube Channel! Visit: http://www.youtube.com/beachboardwalkfun to subscribe. Next time you visit the park, be sure to pick up their newly available “Self-Guided History Tour” of the Boardwalk. The brochure includes points of interest and fun facts about the historic Boardwalk and Cocoanut Grove. The brochure map includes the location of 18 new interpretive signs recently installed around the park. The Historic Walking Tour brochure is available at the Miniature Golf station, inside Neptune’s Kingdom. And don’t forget to sign up for the Big Kahuna Newsletter. It’s FREE! Receive a free subscription to the latest insider news and event information from the Santa Cruz Beach Boardwalk. Their monthly e-newsletter is delivered by email right to your in box. Be the first to know about upcoming concerts, discounts, and special events. Beach News is now available on-line. The eight-page Beach News is published three times a year. Beach News highlights Santa Cruz Seaside Company employees, Boardwalk history, and the many community programs they support. 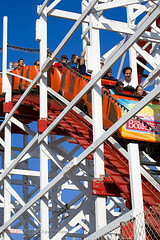 For complete Santa Cruz Beach Boardwalk info please visit http://www.beachboardwalk.com .